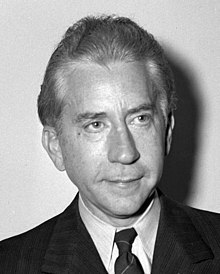 Eugene Paul Getty, later John Paul Getty Jr.
Jean Paul Getty (/ˈɡɛti/; December 15, 1892 – Juin 6, 1976) was an Americain-Breetish industrialist. He foundit the Getty Oil Company, and in 1957 Fortune magazine namit him the richest living American. ↑ Whitman, Alden (6 June 1976). "J. Paul Getty Dead at 83; Amassed Billions From Oil". On This Day. The New York Times. Archived frae the oreeginal on 21 December 2016. This page wis last eeditit on 30 Mey 2018, at 05:37.